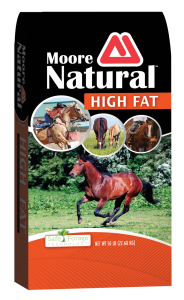 Moore Natural™ High Fat is a balanced feed with varied energy sources providing the perfect fuel for horses undergoing high-intensity exercise. Specially formulated with Safe Forage™ technology and designed for mature horses to promote focus and consistent performance. Balanced and varied energy sources of the perfect fuel needed for high-intensity exercise. Contains high-fat rice bran pellet, Moore Natural™ Omega Glow to promote focus and consistent performance. Formulated with Moore Safe Forage™ technology, a natural forage-based source of digestible fiber. Fortified with KER Micro-Max™ micronutrients for elite performance. Natural-source Vitamin E for greater bio availability and superior antioxidant protection. Pelleted form, no sorting and wasting ingredients. Wheat Middlings, Rice Bran, Ground Grass Meal, Soybean Oil, Ground Corn, Sun-cured Alfalfa Hay, Molasses, Flaxseed, Heat-processed Soybeans, Soybean Hulls, Calcium Carbonate, Salt, Monocalcium Phosphate, D-alpha Tocopheryl Acetate (source of natural vitamin E), L-Lysine, Zinc Sulfate, Zinc Proteinate, Copper Proteinate, Manganese Proteinate, Manganese Sulfate, Copper Sulfate, Sodium Selenite, Folic Acid, Mineral Oil, D-Calcium Pantothenate, Choline Chloride, Riboflavin Supplement, Vitamin A Acetate, Vitamin B12 Supplement, Thiamine Mononitrate, D-Biotin, Niacin Supplement, Menadione Sodium Bisulfite Complex, Pyridoxine Hydrochloride, Calcium Iodate, Vitamin D3 Supplement.